A while back I reviewed the many seafood guides and the various ways they rank seafood choices. They do share one thing in common, however, and that’s the special denotation of certain species as hazardous to human health because of toxin load. Specifically, high levels of mercury and PCBs as found by an Environmental Defense study. First, kudos to EDF for making their data have immediate impact. Other studies of toxins in fish have sat around for literally decades before becoming part of the mainstream discourse about fisheries. But it does beg the question, what makes mercury and PCBs so important among the myriad toxins in our oceans and our seafood? EDF gets their data from over 200 government sources, according to their website, and states “we focus primarily on mercury and PCBs – common environmental contaminants in seafood that are a focus of government data collection efforts”. Despite their use of this data basically because it’s easy to access, these are important ones to measure in terms of human health. Mercury is a neurotoxin that can lead to Minimata disease at high levels and decrease in IQ and cognitive function at lower chronic levels. It is of largest concern to people with the smallest body mass – children and fetuses. The most toxic form of exposure is through methylmercury, which is the type found in fish tissues. According to the National Resource Council, up to 80% of mercury in the atmosphere comes from coal-fired power plants and medical incineration. Atmospheric deposition then accounts for up to 95% of the mercury in our waterways. So until coal as a power source goes away, mercury in fish isn’t going away. PCBs are a more subtle threat to human health, known to cause cancer, skin irritations, and neurobehavioral effects. They are not found naturally and no longer produced in the United States, though they are still commonly found. According to ATSDR, there are 209 types of PCBs, most commonly sold in the commercial mix known as Araclor. They were used largely as insulators in old fluorescent lighting and capacitors. They bioaccumulate in fish after entering waterways from landfill runoff and old industrial sites. 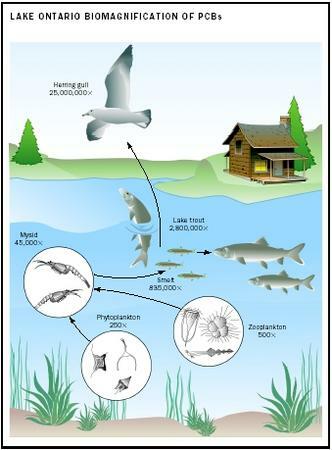 So until more funding is dedicated to water quality and and anthropogenic chemical effects in the ecosystem, mercury and PCBs are a good indicator of what’s going on in our aquatic world.